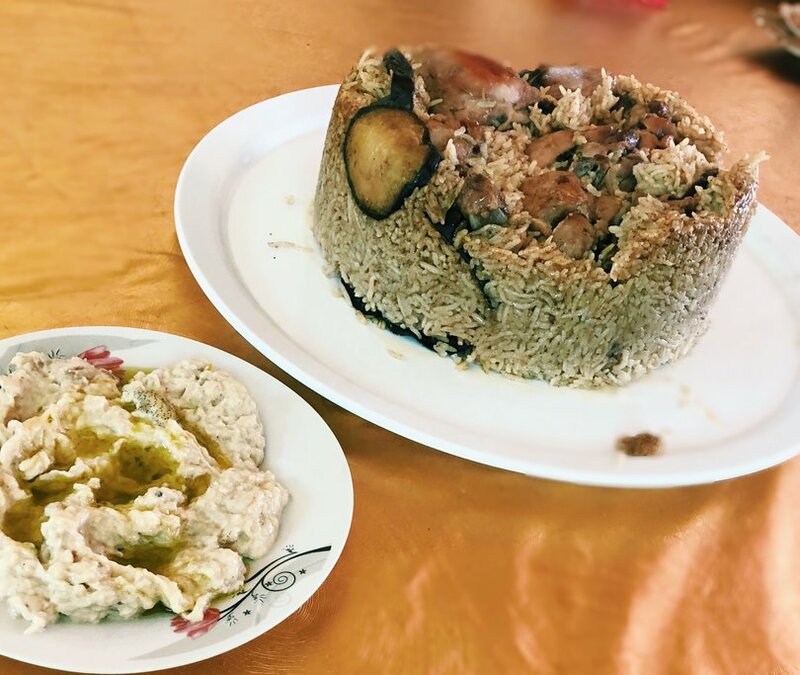 Jordan doesn’t have an official “national dish”—but if the country were to award such a distinction, mansaf would be the winner. A hearty plate of fall-off-the-bone-tender lamb over rice, what makes mansaf unique is the accompanying sauce made from jameed, a dried ball of goat's milk yogurt rehydrated into a tart broth and ladled generously over the meat. Slivered almonds are typically sprinkled on top. Where should you try mansaf? Ask most Jordanians, and they'll scoff at the idea of eating this in a restaurant. But if you must eat out, a reliable option is Sufra, the elegant outpost on Amman's vibrant Rainbow Street. The garden-wrapped building has tile floors and big windows looking out onto the patio, and locals will confirm that the generous portion of mansaf here is (almost) as good as mom makes it. You'll want to finish with an order of decadent um ali, Jordan's equivalent of bread pudding with pistachios and rose water. Schedule a post-lunch nap, you'll need one. Falafel is a middle eastern fast food favorite that transcends borders, and Jordan is no exception: these golden balls of ground chickpeas are available everywhere. It's best sampled in sandwich form: easy to eat, portable, and wrapped up in fluffy pita with a healthy dusting of sumac. 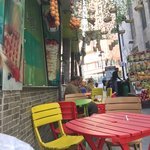 If you're in Amman, head to Al-Quds, a Rainbow Street sandwich window that churns out cheap, delicious falafel sandwiches on sesame bread, dressed generously with tomato and pickles. 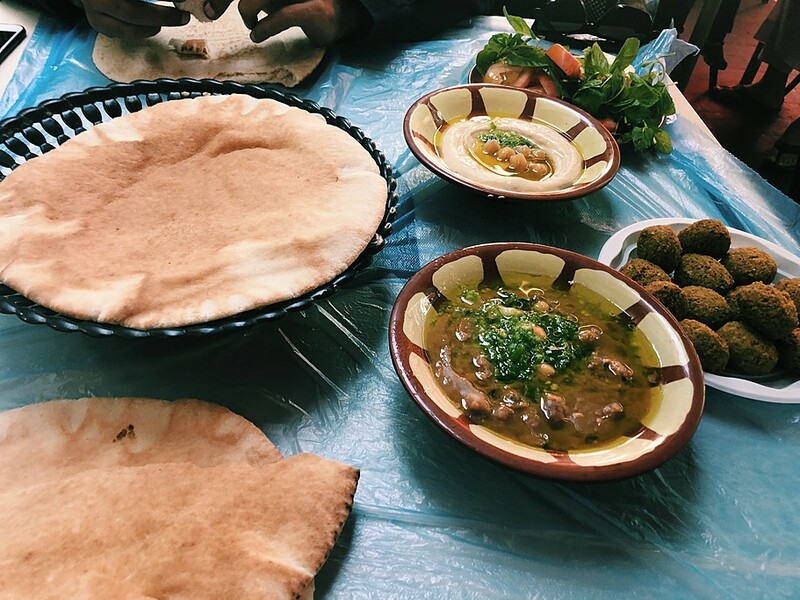 Perhaps the tastiest falafel sandwich in Jordan can be found in Madaba, a town famous for a Byzantine floor mosaic thought to be the oldest surviving map of the Holy Land. Around the corner from the rows of idling tour buses is Shaheen Restaurant, where fluffy balls of falafel are still hot when handed to you in a fresh pita, doused in a homemade sauce that's as spicy as you want it. This is a local hangout for a reason, and you won't regret ditching the tourist traps on Madaba's main drag. If you're lucky, you'll be there when the owner sets up a one-man assembly line to fry an astounding number of falafel balls in one huge pan. The name of this dish offers a clue about the method used to prepare it: maqluba means "upside down" in Arabic. This one-pot meal of stewed meat (often chicken), sliced eggplant, cauliflower, and rice is cooked together and flipped onto a plate for serving. Cinnamon, garlic, and baharat—a spice blend including clove and nutmeg—add to the warming mix of flavors; this is comfort food at its best. Similar to mansaf, you'll want to cross your fingers for an invite into a Jordanian home to try an authentic version of this specialty. Or better yet, invite yourself over by booking a meal or homestay experience—try working up an appetite with an organized hike in the Ajloun Forest Reserve before enjoying lunch with your guide and his family. 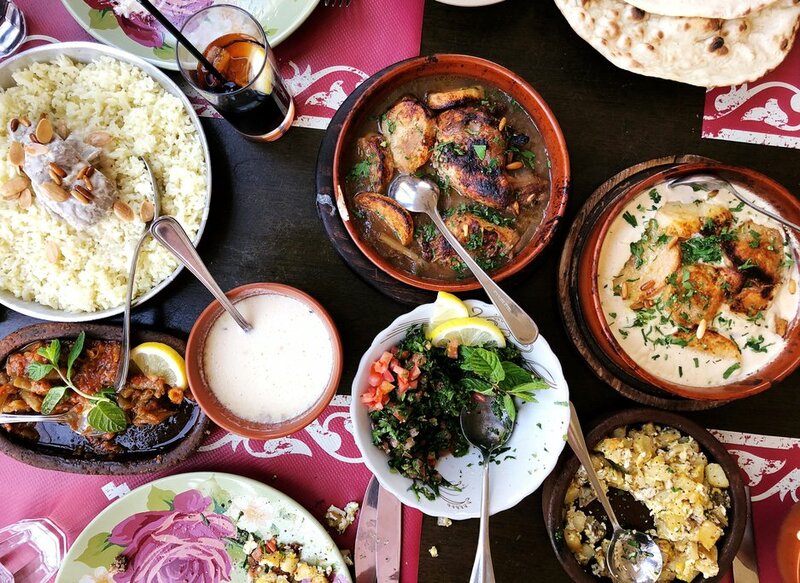 Another option is to take a traditional cooking class; Beit Sitti in Amman has maqluba as one menu option, and after learning from a professional chef, you'll be able to recreate the dish for friends and family back home. Whichever you choose, you can usually expect maqluba to be accompanied by sides like fattoush (a vegetable salad with crispy pita bits and sumac) and mouttabal (roasted eggplant dip with lemon and garlic), so come hungry. Za'atar is a fragrant spice blend ubiquitous in the Middle East, and every country (and city, and family) seems to have their own recipe. The base is almost always a mixture of dried wild thyme, toasted sesame seeds, salt, and tangy sumac, though the ratios vary. From there, cumin, fennel, or other indigenous favorites can be added to the mix. 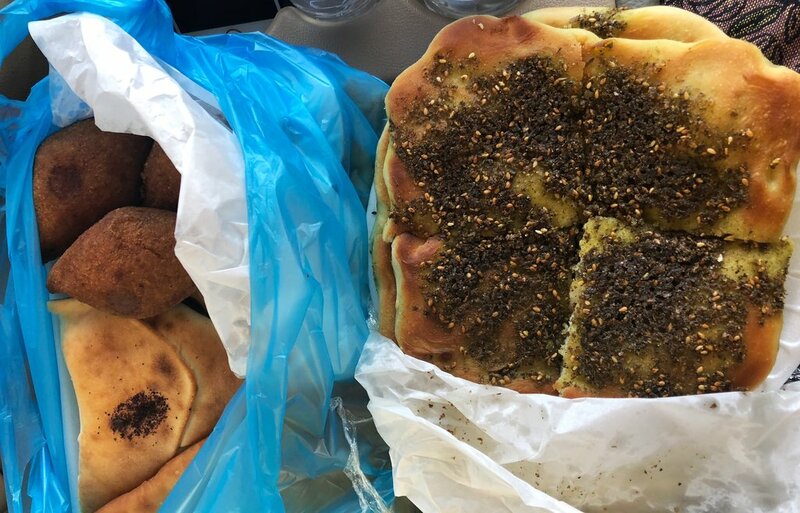 Jordanian cuisine favors the Palestinian blend, heavy on the salt and sesame, sometimes incorporating caraway—and often devoured in the form of manakish za'atar, a flatbread baked with liberal amounts of olive oil and covered in its namesake spice. "Manakish" comes from an Arabic word meaning "carve out:" after the dough is flattened, fingertips press divets for the savory toppings to settle in. Manakish is eaten for breakfast, lunch, or as a snack, so walk into a bakery at any time of day and you're sure to find some. In the northern town of Ajloun, head to Barhoum Bakery after touring the nearby crusader castle—this is the region where heavenly olive oil is produced, and you'll taste the difference. While you're there, pick up some kibbeh to go: fried croquettes with an outer shell of bulgar wheat, onion, and ground beef, stuffed with spiced meat and pine nuts. Tarboush Bakery and Baba Za'atar in Aqaba are also excellent (the latter has "Jordanian pizza" worth trying as well). Jordan's southwestern edge touches the Red Sea, and seafood rightfully dominates this region's restaurant menus. 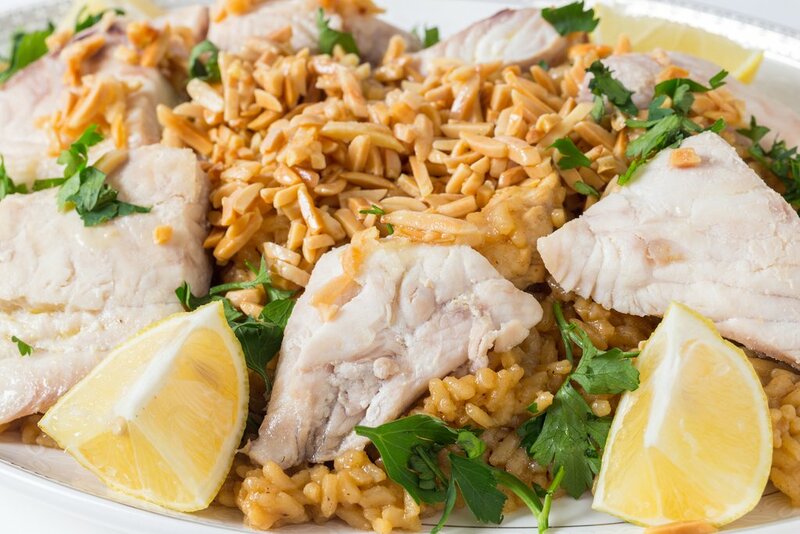 You'll want to try sayadieh, a Lebanese dish that pairs baked or fried white fish with a divine rice mixture, typically featuring a heady combo of saffron, caramelized onions, almonds, citrus, and pine nuts. Aqaba, the port city known for its grand resorts, excellent diving, and tax-free shopping, has a number of restaurants featuring sayadieh—and the featured fish is often the local catch of the day. The Red Sea Grill at the Movenpick Resort is a classy choice, and sayadieh is a mainstay among the rarely changing menu items. You can dine outdoors, the sea views are lovely, and if you feel like switching up your order, the seafood couscous soup is also on point. Captain's is another option—it's undoubtedly touristy, so don't be surprised by the price point and sunburned families, but the seafood is fresh and reliably tasty. Syrupy, cheesy, crunchy, gooey: knafeh seems to contradict itself, but somehow, it works. A popular dessert throughout the Arab world, knafeh is a pastry filled with soft, mild white cheese and topped with a kataifi (shredded phyllo dough) crust. It's then soaked in a sugar syrup with rose or orange blossom water, and finally, garnished with pistachios. 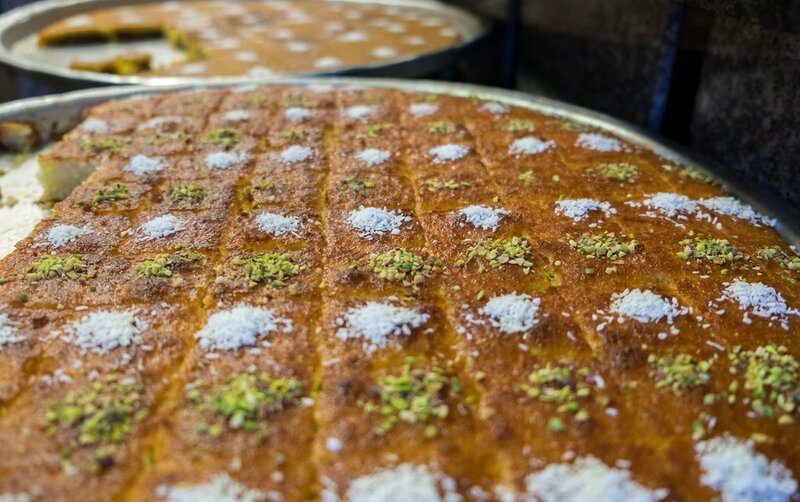 Habibah Sweets is hands-down the best-loved purveyor of knafeh in Jordan, and their location in Amman's bustling city center is the place to go. The store itself is tiny—not much more than a glass counter and a few giant, round trays of knafeh and other sweets like baklava and osh el bulbul (fried kataifi wrapped in nests around pistachios or pine nuts). 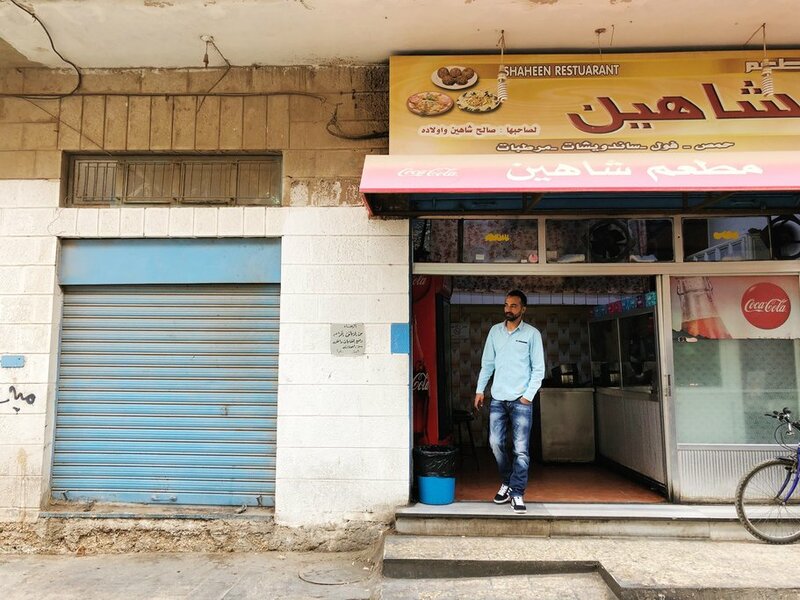 An option in the ancient northern city of Jerash is Green Salon Sweets, where you can grab a fresh square of knafeh to refuel after wandering the city's well-preserved Roman ruins. Even outside the summer months, Jordan can get hot. A popular refreshment is limonana, a Middle Eastern take on lemonade that combines fresh lemon juice, mint leaves, and possibly sugar by blending (or simply muddling—in this case, it's simply referred to as nenae ma'a lemon or "lemon with mint"). Sometimes served frozen, this tart concoction is a boon on Jordan's powerfully sunny days. This drink is common on menus, and generally good everywhere. Make a limonana pit stop while shopping in Amman's city center at Ananas on Al Malek Faisal, just down the block from world-famous hummus shop Hashem. You can also find a particularly fancy version at the luxurious hotel complex Hyatt Zaman outside of Petra. 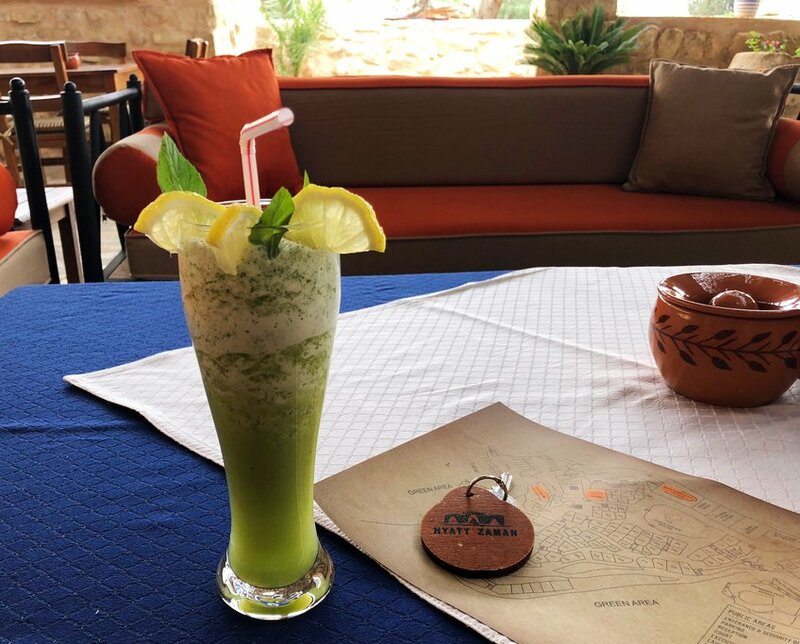 But the best time to imbibe is undoubtedly while lounging at the small café in front of the Monastery in Petra—after climbing 900 stairs to get there, you've earned it, and the lemons are sourced from a nearby orchard. Prepare to be caffeinated: no matter where you go in Jordan, you will be offered cup after cup of coffee or tea. Though espresso and "American" filter coffee are available in some restaurants and cafés, you'll mostly be drinking it the Arabic way. Also known as Turkish or Armenian coffee, the brewing style involves pouring hot water directly over the grounds in a long-stemmed pot, resulting in a thick, strong brew often spiced with cardamom. It's served in small cups with lots of sugar. Tea is similarly strong and sweet, though instead of cardamom, you can expect leaves of sage or mint in your glass. Where should you drink it? Anywhere and everywhere. 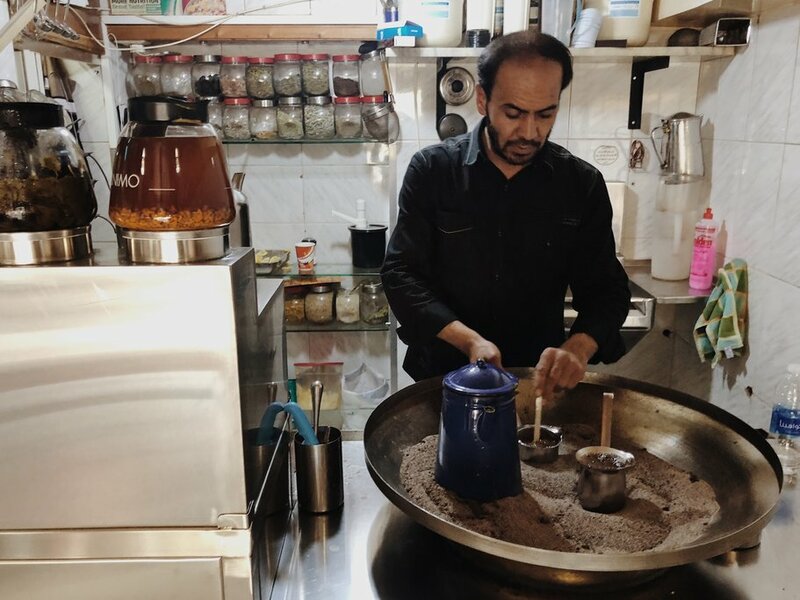 One standout coffee experience can be found in Jabal Amman at the unassuming Ayman Coffee Shop—the owner has perfected an unusual method of brewing coffee over hot sand, and the process is a sight to behold. This is also a great stop if you're feeling under the weather; a slew of tonics are on offer, including a divine mixture of hot water with lemon, ginger, and honey. Tea is most satisfying in the lounge areas of camps in Wadi Rum and outside of Petra—Seven Wonders Camp and Sun City are two good ones—and at roadside and trail-side stands throughout the country.